It doesn’t sound like a complicated choice. If you want to listen to podcasts, there’s a free Podcasts app right there on your iPhone or iPad. Apple makes that app and actually it’s Apple that made this form of audio popular: the pod in podcasts comes from iPod. You might wonder where you get the actual podcasts you want to listen to, but otherwise this all seems very simple —because it can be. There is absolutely nothing wrong with Apple’s Podcasts app. Or rather, there isn’t for most people. For some, there is very definitely a problem with it and for others there are alternatives that do things a little better. For some people, Apple Podcasts is unlistenable because it stutters. It’s such a rare problem that Apple hasn’t acknowledged it but if you’re one of the unfortunate few, it is impossible to keep listening. First you get a sudden silence, like your phone is about to receive a call. Then the audio resumes but maybe it seems a little fast like it’s catching up. However, then it stops again, this time for a fraction of a second and lurches back into the next syllable. So far it appears that iOS 12 fixes the problem but until Apple officially recognizes it and says so, we can’t be sure. We can report that our experience is that the stuttering goes away under iOS 12. And we can also offer a workaround that is certain to fix it. Switch to a different podcast player. It’s not like your choice is limited. There are podcast players that are good for handling large libraries of shows and ones that give you features for skipping or speeding up bits. Plus there are ones with really very dreary names. You’re used to apps taking two words and putting them together to make a name. Sometimes you suspect the makers may not have stepped back to read that name again. Such as when a developer wanted to make an illustration app seem both creative and professional and so called it Procreate. Similarly, you’ll be hard-pressed to find a podcast player app whose name doesn’t end in -cast but the consequence is that we get Overcast and Downcast. Downcast seems to not have been developed much recently but Overcast is one of the most popular players available. Overcast works to make managing podcasts easier and also for altering them. As you listen, for instance, you can tap a button called Voice Boost to alter the audio quality. In our experience it just makes the podcast louder but when you’re driving, that might be what you need. Alternatively, if you’re in a hurry then Overcast also lets you speed up a podcast, for instance. You can already tell Apple’s Podcasts app to play at a range of speeds from half to twice as fast as normal but Overcast does more. 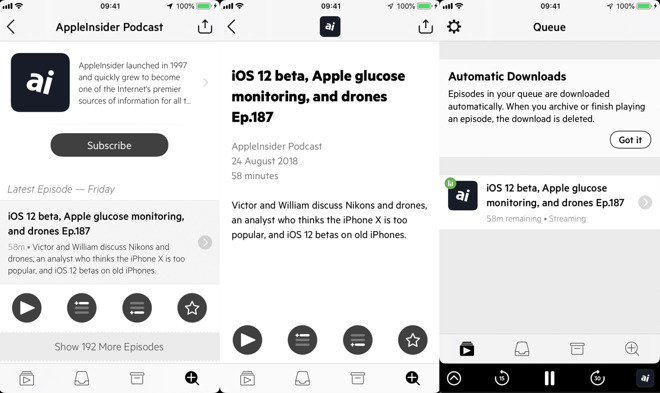 With Overcast, you can say that you want the app to automatically skip over any silent portions of the podcast. 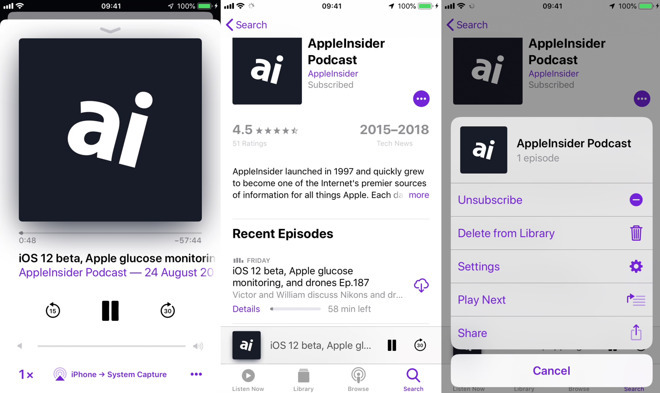 Breaker and Castro now do this too but the feature was introduced in Overcast and it is a way to cut down just how long it takes you to listen to a podcast. Add in the the fact that Overcast will play podcasts up to three times faster than normal and you can really race through your listening. Only, call it our BBC Radio background, but if you find yourself skipping bits and speeding up a podcast, go click on the Unsubscribe button instead. A show is produced to be heard a certain way and there are indeed times when silences are part of it. Podcasts are not a simple information delivery mechanism: if they were, there’d be no difference between a podcast and Siri reading out an article to you. Overcast is a free download and defaults to being supported by ads. They’re as unobtrusive as adverts come and they don’t appear on every page. Plus they’re often ads for other podcasts which can even be useful. Nonetheless, you can pay a subscription of $9.99 per year to optionally remove the ads. That’s not a mistake: removing the ads is an option even when you’ve paid. You can choose to subscribe and to keep the ads as well. Castro has similar features to Overcast but it also addresses an issue that faces the less organized of podcast listeners. As much as you may like various shows, often you’ll find you slip behind on your listening and these things mount up. Apple’s Podcasts app notices when you haven’t played a series for a while and it takes steps. First it stops downloading episodes, then the next time you do go into it, the app asks if you’re still interested. It’s a good system, though it doesn’t appear to have stopped our iPhones getting clogged up with gigabytes of podcast audio. What Castro does instead is stem the tide at its source. Rather than waiting to see what you do, Castro asks you. When you open the app, you’ll see a list of all the podcast episodes that have come in since you last listened, and Castro gives you choices. You can, of course, play one right now. However, faced with an inbox full of them, you can tap to deal rapidly with each one. Play it now or play it next after whatever you’re listening to at the moment. You can tap to add this episode to the back of a queue before you listen to the lot. Or, our favorite feature, you can say no. You might love a series but you can see from the description that you aren’t interested in this edition. Or you can see from your watch that you haven’t got time. So you can tap on an Archive button and that episode vanishes on you but you remain subscribed to the series. All of this is free and it happens to particularly suit how we like listening to podcasts. There is a paid version of Castro, however, which adds options to do with skipping silence but also the ability to load other audio. Rather than solely playing podcasts, the paid edition lets you add any audio you have. That helps make this a single place to listen to everything. Castro”>Castro is free to download and use but there’s a paid version that costs $8.99 per year or $2.99 per quarter. Here’s one for you. 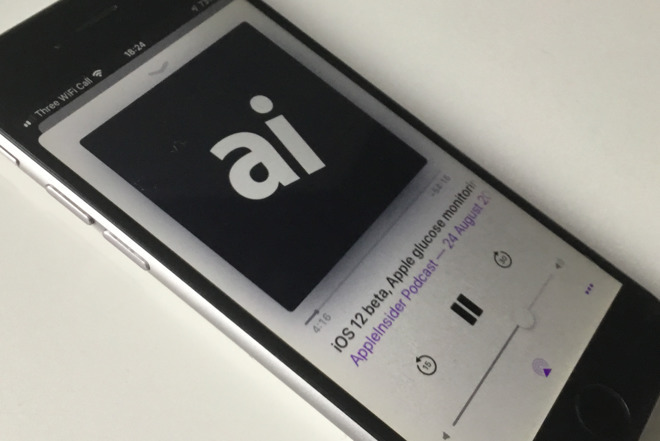 Have a listen to the AppleInsider podcast. Other than by direct recommendation like that, the way you find podcasts comes down to exploring. Podcast apps have different ways of helping you, though. Apple’s Podcasts app is the weakest. It gives you a search bar and you can type in keywords or any search term and hope it turns up something interesting. 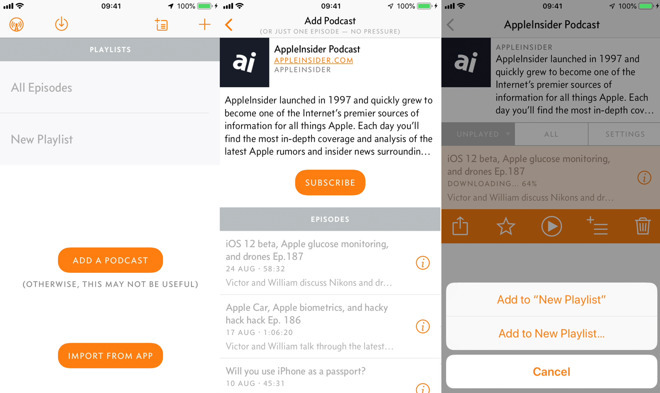 Overcast maintains a visual catalog of recommended podcasts. There’s an overall recommendation plus more in categories such as Arts, Business and so on. Plus Overcast includes a section called Collections which lists podcasts by their makers, such as Relay.fm or Radiotopia. These are more like networks of podcasts. There shouldn’t be any reason to think that if you love the superb design series 99% Invisible then you’ll like others from the same network, yet somehow the odds are that you will. Seeing these sister podcasts and also just seeing icons for many shows does make Overcast feel like a gallery. In comparison, Castro feels a little more barebones. Rather than any visuals, you’re presented first with a listing of topics but then when you go into any of them, you’re shown icons and full titles. Much more elaborate is Breaker. While its features are reasonably basic, it aims to offer you podcasts through social media interaction. As you find ones you like and listen in Breaker, you help other people discover those shows and vice versa. It’s one of those ideas that needs a lot of people to be using the app and a lot of time for it to build up into always offering you something interesting. However, it is a way to get you out of the rut of always listening to the same shows or in the same categories. Breaker is another podcast app that’s free to download but has a paid version. In this case, though, the paid tiers range from 99c to $4.99 and get you exclusive podcast episodes. It seems as if there are podcasts on every topic and that’s probably true. There are certainly enough of them that it’s easy to feel the format is familiar or even tired. Yet these are still early days for podcasts. The production quality of them, the presentation and the entertainment of them is rising. Whether you stick to Apple’s Podcasts app or explore a little further, podcasts are a deeply absorbing addition to your iPhone or iPad. Keep up with AppleInsider by downloading the AppleInsider app for iOS, and follow us on YouTube, Twitter @appleinsider and Facebook for live, late-breaking coverage. You can also check out our official Instagramaccount for exclusive photos.